When pregnant with my last child, my husband sent me a link to this site and said, "hey, let's do this tomorrow after church!" (the logical day for such a photo shoot as it was the only day I donned anything but leggings or sweats). However, all the complications surrounding the HG I was experiencing more or less squelched that idea and alas, they were never taken. Although let's be honest, our version wouldn't have been nearly as cute! But, thank heavens for those pregnancy photos I asked Justin to take a little later on, because although one doesn't feel photogenic when pregnant, it's such an important stage in life and should be documented at some point, in some way. 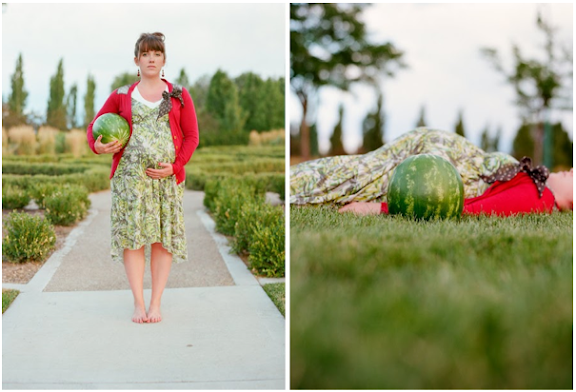 We cannot forget this clever series appropriately entitled Project Baby (photographed by Emily Kunz). I love Miranda's enthusiasm throughout it all and the way she writes to her future child. No doubt he will feel immense love for all the time and effort she put into this...well, someday anyway. Maybe in 20 years? :) I just noticed she now sells the t-shirts in her shop for those who want to create a similar series during their own pregnancy. Another great series from Pacing the Panic Room, this time the blog author features his own wife! Totally fun and personal. I might add she has a killer pregnancy body...I never, ever, ever looked like that, but I know people who do! All y'all are lucky. And last, but not least, this original idea from Carolee Beckham totally made me smile. She documented the different stages of her pregnancy by comparing her unborn child to a different fruit or vegetable--typically one that correlated in weight. Super clever. Would've never thought of it on my own! If you have any other ideas you've seen (or done yourself! ), please share! I have very few photos of me pregnant which makes me sad now that my youngest 5 & a half years old. As for comparing an unborn baby to a fruit/vegie, there has been an hilarious book getting around now for over tens years by an Australian author (Kaz Cooke) called "Up the Duff" (I have no idea if this is just an Aussie slang term for being pregnant or whether it translates worldwide). Kaz does a diary each week & often compares an unborn baby to a fruit or vegie ... hilarious!!! I have not a single picture of me pregnant with my first, and only about four when I was pregnant with the twins. Even though I felt (and looked) like a cow, I'm sad about it. I wish I would've had the motivation, and creativity to do any of these! I also love Bron's, of Baby Space. Her documentation is so stunning, you should really check it out. my husband asked me when i was going to start taking photos of my pregnancy, too. but i haven't felt like striking a pose yet. maybe this second trimester will be a little kinder to me! Cole's series is what got my wheels turning for #2, and I'm so glad I made the effort to create the series. Looking back is pretty amazing. Dave and I laugh about the fruit/veggie comparisons in "What to Expect..." and the BabyCenter weekly emails. That seems to be the easiest visualization for people, so Carolee's series is spot on! I've already got a funny plan for my next bump. 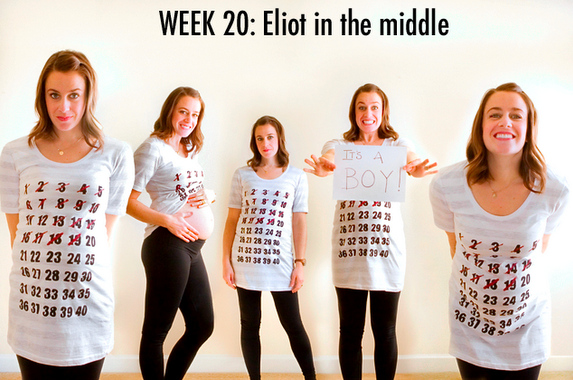 Celebrating the milestones makes the hard bits of pregnancy a little more fun! Little miss air gap, thanks for the rec! Yours Truly...save those pictures!! They are precious and few. The lady, do it!! You won't regret it when it's all said and done. Miranda, I cannot wait to see what is up your sleeve! Clementine & Olive, the timing of your boys is uncanny! You are a lucky woman.